Briggs & Stratton’s Professional engines can best be labeled “prosumer” as they bridge the gap between the company’s EX Series residential engines and the company’s horizontal shaft Vanguard commercial engines. These engines are mostly known for their use in top quality walk-behind mowers, but they’re also found in true professional equipment where weight is at a premium. With the newly redesigned 775, 850 and 875, these engines further blur the line by bringing improvements from both ends of the market to improve reliability and ease of use. The panel air filter has been replaced with a radial air filter. This increases the filter surface area and has two seals to sandwich the filter between the cover and the intake side of the carburetor. Since it doesn’t depend entirely on the pressure and angle of the cover, the provides a better seal to keep dust out of the intake. The air box still uses a tool-free design with large thumb screws built into the cover. The engine controls have been moved from the front to the side of the engine, making them easier to access and cooler to touch now that they’re further from the cylinder head. The ReadyStart system has also been repackaged, moving the starter handle to the rear left side of the engine where it’s surrounded by the engine cover. This keeps the handle from getting hung up on debris and makes it easier for manufacturers to extend the starter handle to the operator’s position. These engines are covered by the company’s Starting Promise: if it takes more than two pulls to start while the engine is still under warranty, Briggs & Stratton will pay for repairs. 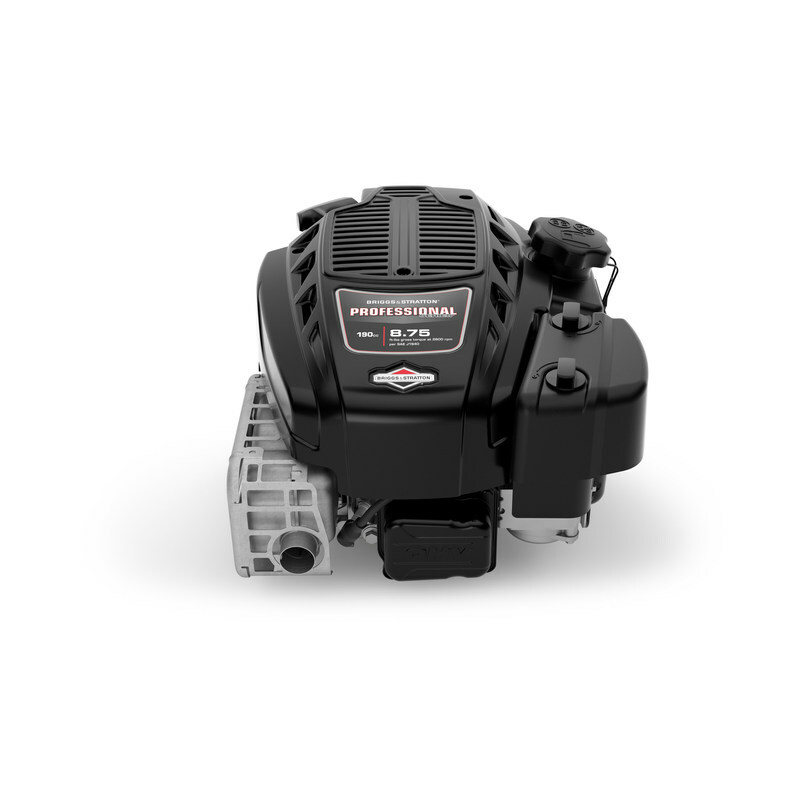 The 775 and 875 are the latest Briggs & Stratton engines to get their “Just Check & Add” technology. Along with the new air filter box, the oil filler neck has also been redesigned to minimize the amount of debris that can enter the engine, keeping the oil cleaner for longer periods. The oil does need to be topped up occasionally to account for burn off, but improved cooling and tighter clearances have made that less of an issue. If the oil does become contaminated, it can be changed just like any other engine. The recommended oil also remains the same, so owners have their choice of off-the-shelf conventional and synthetic formulations. 775 – 175cc, 7.5 lb-ft.
850 – 190cc, 8.5 lb-ft.
875 – 190cc, 8.75 lb-ft. The 850 still requires oil changes, but otherwise, these models are nearly identical down to their 24.5 lb. dry weight. Shank’s Lawn Equipment is more than a Briggs & Stratton dealer: we’ve been helping homeowners and professionals with their outdoor equipment since 1984, and we’re a dealer for many of the brands that use the Professional Series including Troy-Bilt and Little Wonder. If you need help with your engine, visit our shop, located at 4900 Molly Pitcher Highway in Chambersburg, PA, just south of Marion. To get here from I-81, take Exit 10 and drive one mile East. Need parts for your Briggs-powered equipment? We cover most brands including MTD and Murray, and we can ship what you need to any address in the U.S. or Canada. To order, visit www.shankslawn.com. This entry was posted in Uncategorized and tagged Briggs & Stratton, Professional Series Engines, Shank's Lawn. Bookmark the permalink.